After what has been an indulgent Christmas, eating our favourite food and treating our Wintery selves to a few extra treats here and there, the new year is often a time to get back on track. By no means do I mean dieting, because as controversial as this will sound, I find the entire concept/ publishing frenzy unhealthy and a total con, but I do mean to get back to a 'normal' way of living (cutting out the Santa laden excess). A brilliant way to combine eating well with learning new recipes and spending time with my pops, was to make our very own home made soup! The heartiest of comfort foods during the drizzliest of Januarys, but made from scratch with fresh ingredients, tailored to your own tummy rumbling requests. The soup my dad and I chose to create started out life scribbled down on the back of an old piece of paper, copied from some recipe book or another, but has gradually developed through trial and error and has become something of a favourite! 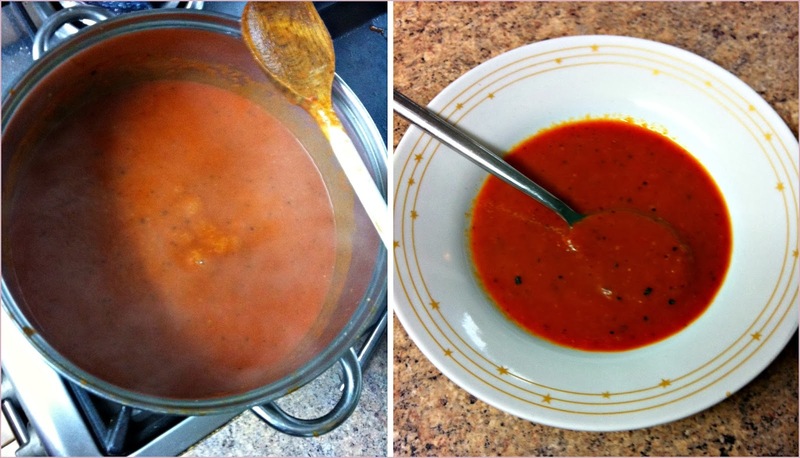 I just about managed to pry the scruffy piece of paper out of his hands and intend to share this home made roasted tomato and red pepper soup with you. 6 red peppers, half them and ditch the seeds and stalk. 8 ripe tomatoes, might be clever to buy them a week in advance (but anything will do really). 1 onion, chop him up good and proper. Garlic clove, original recipe asks for 2, we used 3, I personally would use even more being a mega garlic fiend, don't forget to crush or slice. Olive oil, we had extra virgin olive oil in the cupboard and you only need a few spoonfuls. 900ml vegetable stock, we threw in a combination of veg stock and chicken stock, sorry veggies! 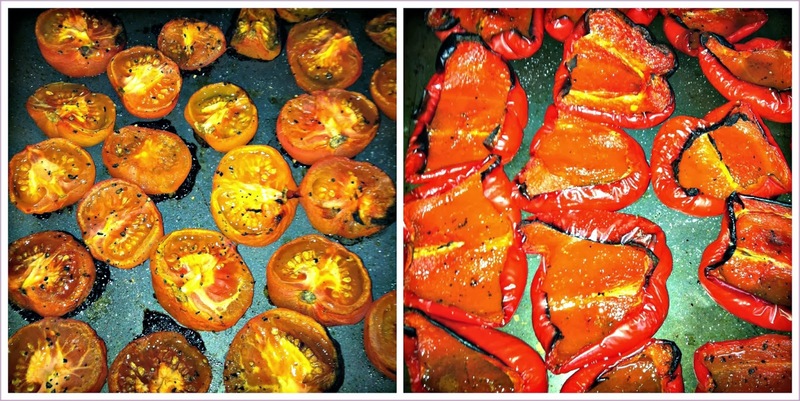 Preheat your oven at 190*/ 375F/ gas mark 5 and heat some water in a pan, enough to cover the tomatoes. 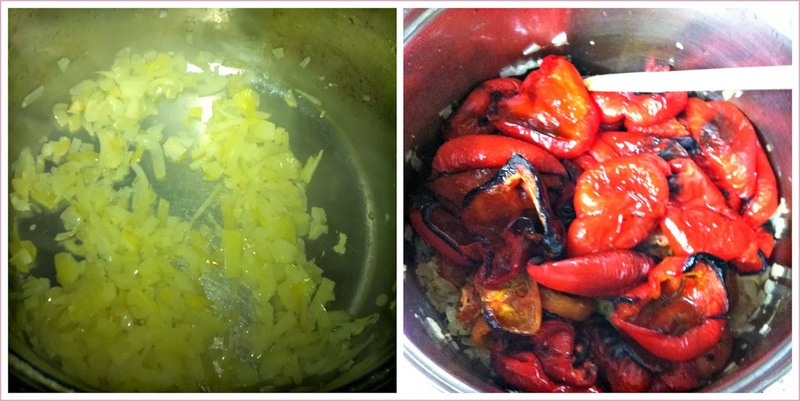 Place the tomatoes into the hot water, poke each one with a knife to pierce the skin then leave them be for 5 minutes. 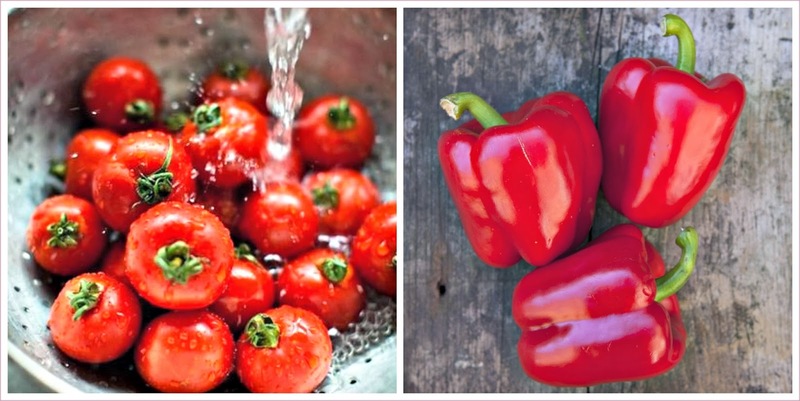 After draining the water, the skin on the tomatoes should peel off easily, then cut them into halves. Lay your peppers and tomatoes out into roasting tins, pour over a tablespoon or two of oil, sprinkle the sugar over and any seasoning. We seasoned with salt and plenty of black pepper. Bake in the oven for an hour. When your hour is almost up, heat a tablespoon of oil in a pan and add your chopped onion and garlic, put his lid on and cook gently for 15 minutes, without browning. To this pan (did I mention to make it a large one? ), add your roasted lovelies and your stock, and bring to the boil. 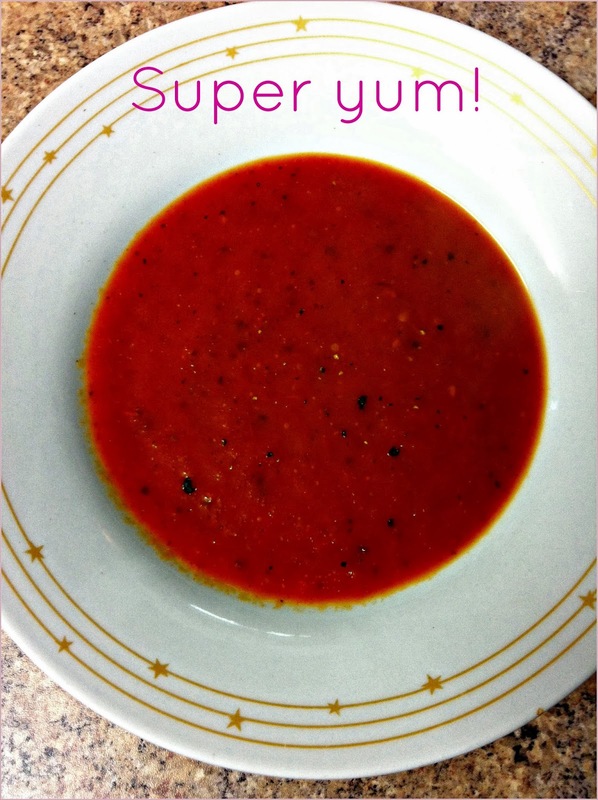 Blend the whole thing and add any extra seasoning you fancy- now is a great time to go wild! Black pepper always goes well with a soup like this but you could try spicing things up with a sprinkling of chilli powder or paprika. Taste it and see! Technically the soup is now good to go, but I recommend letting it simmer for 20 minutes on the lowest heat (don't let it boil), or even, to really give the ingredients chance to settle in, leave it a few hours or over night. Yummy!!! It looks great and sounds very healthy, too! This looks really really yummy!! I have come to a conclusion recently that i HATE canned soup. I've had so much fresh made soup lately that I can't go back to canned...So definitely trying to make this on a cold day soon!